Uncertainty – especially in economics, government, or healthcare - can be hard to handle. Combine a little bit of uncertainty in Washington D.C. and the medical community and you’ll have a window into 2017, a time when the future of the Affordable Health Care Act and the health sector is in flux. Is there a silver lining here? We believe so. 2017 presents an opportunity for healthcare providers to evaluate how technologies like ultrasound can solve their challenges. By expanding their use of ultrasound, we believe providers can attract more patients, increase their patients’ level of satisfaction, and reduce costs. This is a departure from the traditional fee-for-service approach. With fee-for-service, doctors and hospitals are paid based on the number of health care services they deliver, such as tests and procedures. Payment generally has little to do with whether their patients’ health improves. Why is ultrasound technology well-positioned in a value-based healthcare system? Because ultrasound provides quick, safe, efficient answers that physicians can use to make faster decisions about their patients’ treatment options. Ultrasound, especially point-of-care ultrasound, is more efficient and less expensive than X-ray, CT, or MRI. Ultrasound’s value came to light in a study from the ER Department at Mass General in Boston, and the University of Washington in Seattle. Researches wanted to understand if point-of-care ultrasound showed improved patient satisfaction, perhaps as a consequence of improved time to diagnosis and decreased length of stay. The study’s finding showed that emergency patients who experienced a bedside sonography scan reported much higher satisfaction rates with Emergency Department care, diagnostic testing, and with their perception of the emergency physician. The study’s authors believe that point-of-care ultrasound has the potential to expedite care and diagnosis, while improving both patient satisfaction and the patient-physician relationship1. Since patient satisfaction surveys play an increasingly large role in health care organisational management, increasing patients’ overall happiness with a provider or department is more important than ever. For hospital administrators, the rubber really hits the road when they understand that clinics and hospitals can see big cost reductions in using point of care ultrasound as well. An example of this is seen in the study developed by emergency physicians Dr. Arthur Au, Dr. Bon Ku and Dr. J. Matthew Fields. The study sought to understand if CVC lines for patients with difficult IV access could be replaced by ultrasound-guided peripheral intravenous IVs (USGPIVs)2. CVC line placement is one of the most common invasive emergency room procedures, with more than five million central venous catheter (CVC) lines placed in U.S. hospitals each year. CVC procedures can have a complication rate near 15%, which includes susceptibility to catheter-related blood stream infection, or even death. The study’s results showed that in 85 of 100 cases (85%) USGPIVs eliminated the need for CVC placement in patients with problematic IV access. These patients also had zero complications during the follow-up period. The results of this study spurred changes at the hospital has made it standard emergency department practise that patients with difficult IV access undergo attempts at ultrasound-guided peripheral IV catheter placement before insertion of a CVC. When you consider an approximate 15% complication rate for CVC procedures, the use of USGPIVs could lower rates to 2.25%. 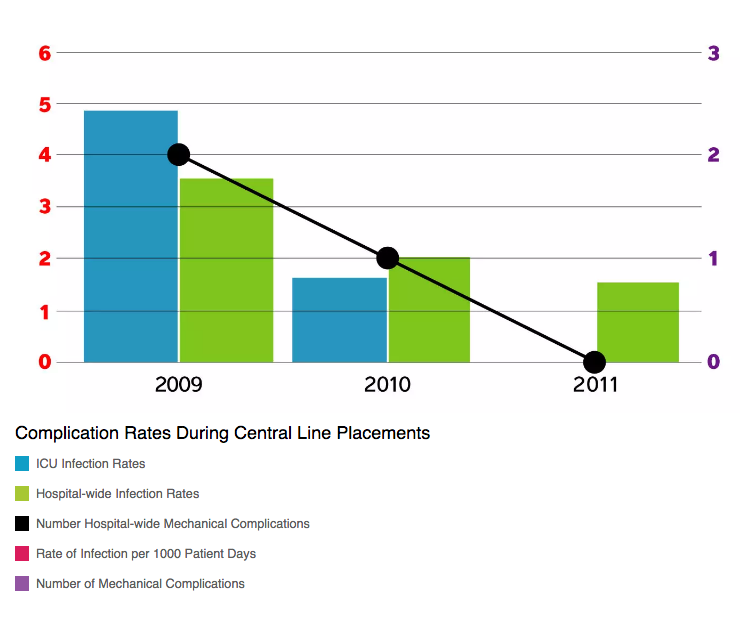 That’s an improvement in patient safety. With the cost of each CVC complication ranging from approximately $15,000 to $50,000, greater use of USGPIVs can mean a significant reduction in emergency department healthcare costs. That’s a benefit to the bottom line. Patients who arrive at an Emergency Department and are treated quickly and efficiently with the least invasive procedure possible (and with as few needles as possible) are going to have higher satisfaction rates than patients who experience iatrogenic pneumothorax. That’s a boost in patient satisfaction. Right now, many medical providers are feeling uncertain about the future of healthcare in our country. But point-of-care ultrasound provides a valuable solution to some of the most complex challenges that healthcare is facing. SonoSite believes that value-based care is good for the healthcare industry, and even better for patients. 1. "Bedside ultrasound maximizes patient satisfaction." J Emerg Med. 2014 Jan;46(1):46-53. doi: 10.1016/j.jemermed.2013.05.044. Epub 2013 Aug 12. How Can Ultrasound-Guided IVs Reduce Complications and Save Money at Your Hospital? Transitioning from volume- to value-based care, healthcare systems must identify ways to deliver high-quality healthcare efficiently. SonoSite understands this imperative. Aiming to increase patient safety, eliminate complications and reduce the number of attempts, The SonoSite Solution, a comprehensive, self-guided programme, for safer central venous catheter (CVC) and peripheral intravenous catheter (PIV) insertions, is now available exclusively to SonoSite customers.